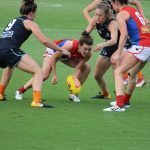 THERE were big crunches, exciting goals and high-flying marks in an entertaining round of AFLW on the weekend. 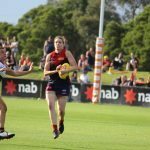 The AFL Draft Central women’s footy writers watched every game closely, and analysed each player, ranking the top 20 players from each game, and will continue to do so each week. The vice-captain was intimidating in the midfield, and really broke her way into the game in the third quarter. Got a lot of the footy, racking up 12 disposals. Great on-field leader. 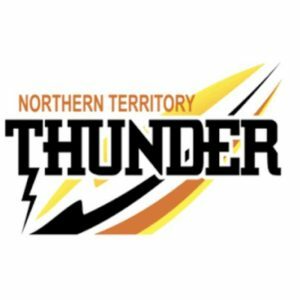 Broke the league record for tackles, laying 16 of them on the night! Leading patterns were exquisite. Cracking hands on display all night, and presented as a contested marking beast. Created so many opportunities all over the ground, not just up forward. Huge tackle on GWS’ Renee Forth in the dying seconds showed how keen she is to do well for her new side. So clean with the footy in hand. Lowered her eyes whenever she got the ball and looked for an option. Knee injury was devastating for all footy fans, not just the Blues faithful. Real good in-and-under style game. Always dished off the footy to her teammates. Great hands under pressure. Was up and about early. Got plenty of the footy and had clean hands throughout the night. Carlton looked stronger with her back in the side. Aggressive tackling was on display all night. She always dug in deep at the heart of the contest. Made an impact all over the ground. Almost looked like the footy followed her at one point in the game. Saw her head pop up at every contest. Played along the boundary a lot at the start, trying to get a gauge of the conditions. Once she did, she was unstoppable. Was the leading disposal-getter for the Giants. Such an active player, went in hard at the footy whenever the ball came into her vicinity. Just needs to polish her kicking in front of goal. Could benefit from a longer run-up when taking a set shot. Tried hard and dug in deep all night. She has a great ability to run through the corridor, and uses it really well. Shame she missed the shot at goal at three quarter time, which would’ve taken some pressure off her side. Long, booming kick that was executed well, even in the trying conditions. Got a lot of the footy and can absorb strong tackles. Crunched by Tayla Harris at the end, but came off better than Harris did. Aggressive in defence. Put her head over the footy and was in plenty of contests in the middle of the ground. Much better performance this week after a quiet round one from her. Showed intent early. Good on-field leader and a smart kicker. A real gritty performance from the youngster. Had a go in the midfield, and rushed down back to put her head over the footy. Good overhead mark for a small player. Effort around the footy paid off as she kicked Carlton’s first goal of the night. Work rate improved so much after last week. Showed more belief in herself. Had four shots on goal, but could only convert one. Does not need to rush. Proactive early, just lacked a bit of polish. Has heaps of pace. Strong chase in the forward line ended up with her having a snap at goal, which just missed from a tricky angle. In hard at the footy. Didn’t stop trying all night. Aggressive, and took the game on multiple times. High-risk, high-reward type game from her. Great courage shown in defence throughout the night. Can take a cracking mark. One of the performances of the year already. Hard to beat in a contest with her elite agility, and beautiful kicking. Always lowered her eyes and picked the smartest option. All 21 of her disposals were classy and skilful. Took a ridiculous amount of intercept marks. She was like a brick wall in the backline, no-one could penetrate past her. When disposing of the ball, she had good control and was able to kick into space. Provided good presence up forward, and marking was good particularly in the second quarter. She was able to work up the ground a lot. She showcased not only her goal-sense, but her fantastic endurance. Executed penetrating kicks throughout the whole game. She was smart and read every situation really well. Knows how to find a teammate. Another impressive game from the Darebin premiership captain, as she ended up with 19 disposals. First touch not only ended up in a goal, but a potential goal of the year! 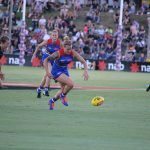 Her pace caused real issues for the Crows, and she used her bursts of pace wisely. Every time she got the ball, you knew something exciting was about to happen. Displayed excellent pace all afternoon. She always went in hard at the footy, particularly in the forward line. Real in-and-under type game from her. Racked up 20 disposals in an impressive performance. She was the best reader of the footy on the field. Shutdown tackling was exquisite, laying 11 of them. Did all the hard work in the middle, and ended up with 17 disposals. Had a great ability to run and carry. Always looked to play on and keep the game moving. Thumping kick. 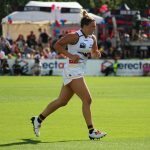 The reigning AFLW Rising Star fought hard for the Crows, with a team-high 18 disposals. Adelaide needed her all over the ground. Endurance and experience was on display throughout the afternoon. Played in the midfield then went to play in the backline. Excelled in both positions. Displayed great acceleration and played tight on her opponent. Racked up 20 disposals and laid seven tackles. Her power is head-and-shoulders above the rest. Able to burst and accelerate through packs to move the ball forward. Got a major on the board to cap off another great day for her. Played a real aggressive game, and racked up an impressive 17 touches. Took the game on whenever she had the ball in hand. Displayed great leadership, and most importantly, she really looked like she enjoyed herself out there. A handy 10 disposals for the defender. Did well to shut down Adelaide’s dangerous forwards. Executed great clearing kicks. Was one of Adelaide’s best. Came to the ball rather than waited for it, anticipation was impressive. Another solid game from the youngster. Played on-ball for a bit, and displayed good pace and agility in patches. Was brave in the back-line. Had to do a lot of mopping up, as Melbourne’s slingshot footy meant quick entries into the forward 50. Really smart player with a blistering kick. You know you’re safe when the ball is in her hand. Good defending on Sarah Perkins. Kept her to just three touches. Had good presence around the footy, particularly in the forward line. Great all-round game. Gained plenty of the footy whilst applying strong pressure all day. Polished it off with two goals, and was the driving force behind Fremantle’s first quarter fightback. One of the best players on the ground, had an electric start. Seventeen possessions (mostly kicks) hit her targets well throughout the game. Ball magnet, and among the leading possession getters on the ground. Fifteen of her 17 possessions came by foot, and she made good use of them. Fantastic game. Fremantle’s second leading possession-getter on the ground. Good use of the ball by hand and by foot. Also laid six tackles. In and around the contest all day. One of the leading possession-getters on the ground, with a high number of them, contested. Excellent performance. High number of possessions, high levels of pressure, and good in the air, taking three marks. Made the most of her opportunities up forward with two goals. Provided a good target for the midfielders all day with six marks. Kicked Fremantle’s first goal of the game. In and around the contest inside 50. Inefficient in front of goal, kicking only one major and two behinds from three opportunities. Followed up an excellent performance in round one with another strong outing. Fought through the physicality her opponents threw at her. Laid an excellent run-down tackle in the second quarter. Gained 15 possessions and displayed terrific ball use. Gained a lot of the ball all day in the midfield, and opened up a number of scoring opportunities for the Pies. Great all day, finishing with over 20 disposals. Played in the midfield for most of the day, and gained plenty of the ball. Used her pace and skill to drive the Dockers forward. Instrumental in the early stages of the game, helping Collingwood stem the flow after the Dockers got on a roll. One of Collingwood’s better players. Excellent start to the game with a mark and goal. Was also involved in the play to set up Emma King’s goal early in the game. Added to her goal-kicking tally in the third quarter, booting through a major to keep Collingwood within striking distance. Read the ball very well through the air. Had several chances inside 50 both in the air and at ground level. Provided pressure throughout the entire match. Leading tackler on the ground and provided good ball use moving forward. Provided good run out of defence, several rebounds 50s, and helped in shutting down Collingwood’s scoring opportunities. Played well in patches during the game. Used the ball well, and tallied up 13 possessions. Kicked a much-needed goal for the Pies in the last quarter. Solid performance, gaining 13 possessions. A steady hand down in defence to help Chloe Molloy out, who received a lot of attention from the Dockers players. Good start to the game with five possessions in the first quarter. Kept relatively quiet throughout the remainder of the afternoon. Put in the hard yards all night. Great leadership displayed in defence. Applied attacking pressure with the 15-20 metre kicks, similar to last week. Great vision to switch the ball in defence to create attacking opportunities. Ran all day at a cracking pace in the heat. Precise kicking to forward targets creating scoring opportunities for her team, with a huge number of tackles. Great defensive marking, and solid defending throughout the game. Good positioning and vision. Fast sidestepping midfielder. Had 21 disposals and five strong marks. Created much needed ball movement, particularly in second half, when a long kick nearly went through the goals. Would have surely converted if it was not against the breeze. Good consistent ruck work on O’Connor with effective follow-up on the ball. Effective hitouts against Ernst in second half. Dominant first quarter. Won the hard ball. Pace right up in the heat. Good tackling which created free kicks. 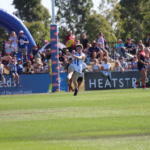 Played on and kicked a vital goal in final quarter. Good long kicking. Much improved ability to absorb tackles, showed her balance and strength. She backed herself and took courageous marks. Played with confidence throughout the game. In the second quarter she snapped a kick out of a pack cleanly for a great goal. Great ability to find space. Two exciting goals. Used the last-touch rule cleverly to paddle the ball onto the foot of her opponent on the boundary, setting up a much-needed scoring opportunity. Nailed it with a clever bend from the boundary, reading the breeze like no one else on the day. Reliable with strong marking and kicking ability. Creative player. Strong tackling. Presented well in packs but just couldn’t bring it down at times. Took a strong mark late in second quarter. In front of goal, she was susceptible to pushing her kick to the left, and was disappointed with it. Needed better delivery from the midfielders. Effective tackling keeping the Lions within reach until early in the final quarter. Good work-rate and running throughout the day. Presence on field is felt by opposition due to her strength and imposing physique. She played steadily and took strong marks. Another great performance. Strong tackling. Dug deep, fighting in packs to keep Bulldogs’ possession. Made good ground to apply pressure all day. Great long goal in second quarter. Good ability to crash through packs and absorb tackles. Strong body and work rate. Excellent intercepting marks when it mattered in the last quarter. Strong tackling and applied pressure all day. Created forward opportunities. Played both ends of the ground effectively when required. Solid performance again this week. Consistent tackles that stuck, and displayed strong marking. Ran into space with confidence to move the ball forward. Worked hard both ways through the midfield. Ran hard, used the ball well, and created good ball movement. She possesses a quick handball which was useful in the contested situations. Skipper stood up when it mattered. Consistently effective again in her defensive role. Great defensive bursts from the midfield, and accurate kicking into the forward line. Strong leadership. As per last week, solid performance. Covered a lot of ground with pace, swept up on the backline and moved the ball forward for her team. 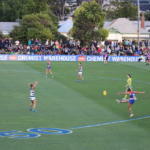 She ran well through the midfield, shutting down Brisbane’s opportunities to go forward, particularly in the first half. Great final-quarter goal. Creative midfielder, loves to run in space and can kick long and accurately into the forward line. Lifts the side with her exciting attacking. Solid ruck work as usual. Precise long kicking to targets created scoring opportunities for her team.